NOTE: This is an editorial I wrote for Orlando Attractions Magazine in 2010. I recently found myself at Downtown Disney’s West Side for a concert at House of Blues. At the end of the night I decided to take a walk down memory lane. When I was 17 to 18 years old I worked for Pleasure Island Outdoor Foods. It’s been some time since I’ve returned to the island where I spent so much time as a youth making a small living, learning about alcohol and trying to sneak into Mannequins, so I thought a stroll through the (now closed) island would be fun. Pleasure Island in its heyday consisted of seven nightclubs on a massive island. 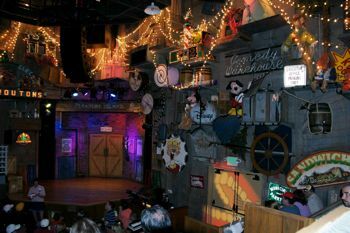 You would pay an admission price (often near $20) and gain access to all of the clubs, the party atmosphere of the island itself and an “every night is New Years Eve” show on the West End Stage. When you approached Pleasure Island from the Marketplace side of Downtown Disney you would purchase a ticket at one of the two train car ticket booths (renovated from the former Fort Wilderness railroad) and proceed across the bridge to the turnstiles where you would find yourself in the shadow of the behemoth Mannequins Dance Palace. Mannequins was a gigantic state of the art nightclub complete with a round spinning dance floor and multiple levels of tables, sofas and various places to congregate with friends, or look for love on a night out. The building now sits empty with its marquee still towering over the street. Walk straight ahead and you would pass the P.I. Live “radio station” where DJs hosted a nightly street party in front of the Hub Stage. Several times a night the Pleasure Island dancers would hit the stage and perform to high energy dance and pop music. The stage is now a gaping hole complete with boat dock. The dock lies at the end of a sidewalk that separates the new Paradiso 37 restaurant, and the former Rock n’ Roll Beach Club. Rock n’ Roll Beach Club was a favorite among locals. You could catch a live band playing covers practically every night and goofy DJs playing rock n’ roll hits in between sets. Right next door was Motion (its final of many identities), a club that catered to a younger crowd and played primarily top 40 hits. It’s now completely inaccessible thanks to a “wall” of bushes placed in front of the entrance. Walking up the crowded street you would begin to hear songs you remembered from the ’70s and ’80s pumping out the painted double doors that lead to 8Trax. Like an escape into an Austin Powers movie, this club did the disco era right all the way down to the mirror balls, fog machines and lighted block flooring. The building is still painted in bright disco hues but the trademark “8Trax” sign is now painted over and the club sits vacant. Across the street is a curious looking building that almost dared you to come in and check it out. 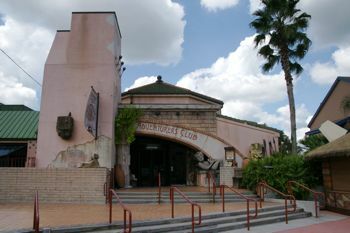 The Adventurers Club was themed to resemble a 1930s style British explorers club complete with talking artifacts on the walls and a cast of improv actors portraying a wild group of characters that seemed to get more hilarious every night. The building is still standing with its Adventurers Club flag flying high. The arched stone sign still marks the entrance of another one-of a-kind Disney experience reduced to a festering empty building. On a busy night you would often find yourself at The West End Stage (topped by a giant neon Jessica Rabbit) at midnight for the New Year’s Eve countdown show and fireworks, or catching Frankie and the West End Boys blasting some of your favorite songs in full concert sound. However, the West End Stage is no more. Instead, all that remains is a pedestrian bridge to Downtown Disney’s West Side. After that you might be off for a night of dancing in the hottest in hip-hop and R&B at the BET Soundstage Club. Originally the Neon Armadillo (1989-1998), catering to a country crowd, the BET Soundstage Club became a staple in the local hip-hop community. The building still says “Soundstage Club” but obvious scars remain from where BET removed their logos from the signs. No doubt in hopes that their name would not sit on the outside of a dilapidated building for years to come. I’ve saved my personal favorite club for last because it was often my last stop after a night of partying with friends at Pleasure Island. Comedy Warehouse was the best improv comedy club in Orlando. A troupe of very talented improv comedians hosted the show several times nightly and you never got the same show twice. It was the Orlando equivalent of having “Whose line is it anyway?” every night at Pleasure Island, and the 12:05 a.m. show was always (in my opinion) the most entertaining. The building now sits empty with cafe tables and another “wall” of bushes completely obstructing the view of the door to one of the coolest places on Disney property. 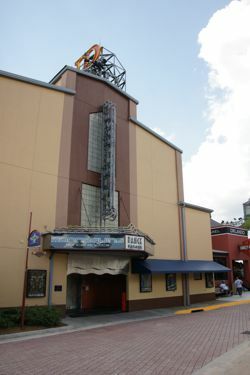 The Walt Disney Company announced in June of 2008, that it would close the doors of the beloved nightspots for the last time on Sept. 27, 2008, to make room for more “family friendly experiences” in the form of more shops and restaurants. As a child I remember Disney being the masters of closing an attraction and making it completely disappear so that it all looked like a purposeful “part of the show.” In my walk through Pleasure Island, I saw a place that has become nothing more than a waste of acreage and a very visible example of a poor decision to close an iconic part of Walt Disney World. Pleasure Island was one of, if not the most popular nightspot in Central Florida from 1989 to 2008. It showed that Disney had a side that didn’t take itself too seriously to have a good time. It’s almost haunting to remember the complex that is now a hollow shell of its former glory. The nights of dancing until 2 a.m. with friends and family, “cast member night” on Thursdays and knowing that you could go to Pleasure Island any night of the year, wipe the slate clean, and countdown to a new year all over again. As I exited a nearly empty Pleasure Island at 11:30 p.m. I saw a sign that proclaimed, “It just gets better!” I found myself thinking, “Really? When?” The closure of Pleasure Island to make room for more “family friendly” money making opportunities marked the end of an era at Walt Disney World; an era where the adults were part of the “family” too.